This is the first in a series of "Intelli-Gen Kids" apps for Android. This app enables children (as well as grown-ups, not conversant with Hindi language) to learn Hindi language. 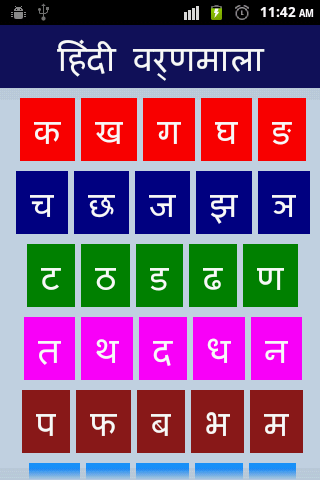 The app uses a simple style and replaces the beginner Hindi books completely. The app is useful for children of all age groups - toddlers, kindergarten, pre-nursery, nursery kids as well as older kids who are learning Hindi letters and words helping them to form Hindi sentences. The app is also useful for grown-ups, who are not very well-conversant with Hindi language, to learn it and further enhance their knowledge of Hindi language using this app. NOTE: Available for 'ka' words only in the free version. Learn Hindi for Kids (full featured version) includes sound for all the words in the list.